Hi there! After reading this post, you will know all you need to know on the dynamics of quasi-satellites. This is the opportunity to present you On the co-orbital motion in the planar restricted three-body problem: the quasi-satellite motion revisited, by Alexandre Pousse, Philippe Robutel and Alain Vienne. This study has recently been published in Celestial Mechanics and Dynamical Astronomy. 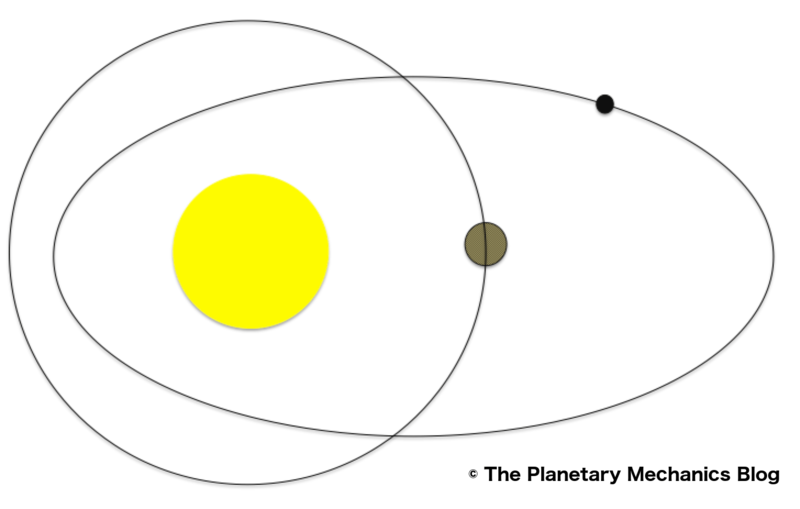 Imagine a pretty simple case: the Sun, a planet with a keplerian motion around (remember: its orbit is a static ellipse), and a very small third body. So small that you can neglect its mass, i.e. it does not affect the motion of the Sun and the planet. You know that the planet has no orbital eccentricity, i.e. the static ellipse serving as an orbit is actually a circle, and that the third body (let us call it the particle) has none either. Moreover, we want the particle to orbit in the same plane than the planet, and to have the same revolution period around the Sun. These are many conditions. Under these circumstances, mathematics (you can call that celestial mechanics) show us that, in the reference frame which is rotating with the planet, there are two stable equilibriums 60° ahead and astern the planet. These two points are called L4 and L5 respectively. But that does not mean that the particle is necessary there. It can have small oscillations, called librations around these points, the resulting orbits being called tadpole orbits. It is even possible to have orbits enshrouding L4 and L5, this results in large librations orbits, called horseshoe orbits. All of these configurations are stable. But remember: the planet is much less massive than the Sun, the particle is massless, the orbits are planar and circular… Things become tougher when we relax one of these assumptions. And the authors assumed that the particle had a significant eccentricity. Usually, increasing the eccentricity destabilizes you. This is still true here, i.e. co-orbital orbits are less stable when eccentric. But increasing the eccentricity also affects the dynamical structure of your problem in such a way that other dynamical configurations may appear. And this is the case here: you have an equilibrium where your planet lies. Ugh, what does that mean? If you are circular, then your particle is at the center of your planet… Nope, impossible. But wait a minute: if you oscillate around this position without being there… yes, that looks like a satellite of the planet. But a satellite is under the influence of the planet, not of the star… To be dominated by the star, you should be far enough from the planet. I feel the picture is coming… yes, you have a particle on an eccentric orbit around the star, the planet being in the orbit. And from the star, this looks like a satellite. Funny, isn’t it? And such bodies exist in the Solar System. Orbit of a quasi-satellite. It follows the planet, but orbits the star. Venus has one known quasi-satellite, 2002 VE68. This is a 0.4-km body, which has been discovered in 2002. Like Venus, it orbits the Sun in 225 days, but has an orbital eccentricity of 0.41, while the one of Venus is 0.007. It is thought to be a quasi-satellite of Venus since 7,000 years, and should leave this configuration in some 500 years. These bodies are all smaller than 500 meters. Because of their significant eccentricities, they might encounter a planet, which would then affect their orbits in such a way that the co-orbital resonance would be destabilized. However, significant inclinations limit the risk of encounters. Some bodies switch between quasi-satellite and horseshoe configurations. 329P/LINEAR-Catalina and 295P/LINEAR being comets. Moreover, Saturn and Neptune both have a confirmed quasi-satellite. For Saturn, 2001 BL41 should leave this orbit in about 130 years. It has an eccentricity of 0.29 and an inclination of 12.5°. For Neptune, (309239) 2007 RW10 is in this state since about 12,500 years, and should stay in it for the same duration. It has an orbital eccentricity of 0.3, an inclination of 36°, and a diameter of 250 km. Then you expand and keep what you need. One of the pillars of this process is the averaging process. When things go easy, i.e. when your system is not chaotic, you can describe the dynamics of the system as a sum of sinusoidal contributions. This is straightforward to figure out if you remember that the motions of the planets are somehow periodic. Somehow means that these motions are not exactly sinusoidal, but close to it. So, you expand it in series, in which other sinusoids (harmonics) appear. And you are particularly interested in the one involving λ-λ’, i.e. the difference between the mean longitude of the planet and the particle. This makes sense since they are in the co-orbital configuration, that particular angle should librate with pretty small oscillations around a given value, which is 60° for tadpole orbits, 180° for horseshoes, and 0° for quasi-satellites. Beside this, you have many small oscillations, in which you are not interested. Usually you can drop them in truncating your series, but actually you just average them, since they average to 0. This is why you can drop them. To expand in series, you should do it among a small parameter, which is usually the eccentricity. This means that your orbit looks pretty like a circle, and the other terms of the series represent the difference with the circle. But here there is a problem: to get quasi-satellite orbits, your eccentricity should be large enough, which makes the analytical calculation tougher. In particular, it is difficult to guarantee their convergence. The authors by-passed this problem in making numerical averaging, i.e. they computed numerically the integrals of the variables of the motion over an orbital period. Once they have done this, they get a simplified system, based on one degree-of-freedom only. This is a pair of action-angle variables, which will characterize your quasi-satellite orbit. This study also requires to identify the equilibriums of the system, i.e. to identify the existing stable orbits. So, this study is full of mathematical calculations, aiming at revisiting this problem. The authors mention as possible perspective the study of resonances between the planets, which disturb the system, and the proper frequency of the quasi-satellite orbit. This is the oscillating frequency of the angle characterizing the orbit, and if it is equal to a frequency already present in the system, it could have an even more interesting dynamics, e.g. transit between different states (quasi-satellite / horsehoe,…). The web page of Alain Vienne. Previous PostOur water comes from far awayNext PostHow rough is Mercury?